Rain or shine, 52 weeks a year, hundreds of needy people have a hot meal and a community gathering place because generous supporters like you. Understanding food is a human right and hunger is a human wrong. Every Sunday for twenty-five years Potluck in the Park volunteers have prepared and served healthy wholesome meals with dignity and kindness. The secret to Potluck in the Park’s staying power is the story of its people. Our tenacious teams of career-volunteers have inspired thousands of other volunteers to donate their time, talent and money to fight hunger in Portland. Their dedication and passion has made Potluck in the Park a touchstone for a community in crisis. We will be in the next block north of the Park Blocks adjacent to the sculpture in front of the Pacific Northwest College of Art (PNCA). This is between 8th Ave and Park Ave on NW Glisan, one block west of Broadway and one block south of the Main Post Office. This will be our new home until further notice. Since we last communicated with you the Portland Bureau of Transportation (PBOT) received the report they had contracted for from an outside engineering firm on the structural integrity of the O’Bryant Square parking garage. They were looking for a solution to repair the extensive water leakage in the ceiling. To their surprise, and ours, the report informed them that the structure was in danger of falling apart. Not only has the garage remained closed, O’Bryant Square itself has now been closed and the entire block fenced off. PBOT had originally closed this garage to all users last September while awaiting the results of this study. That closure forced Potluck to relocate under the Hawthorne Bridge ramp in Waterfront Park for the winter in order to have cover from rain or snow. We knew from the start that this would only be a temporary location. Parks and Rec had only given us permits until the end of February. The abrupt permanent closure of O’Bryant Square sent us on a frantic effort to find an alternative location. Because the wheels of not only the bureaucracy, but private business, sometimes turn very slowly we were forced to, and be lucky enough to be able to, extend our stay at Waterfront Park until last Sunday. This new space belongs to Portland Parks and Rec even though it looks more like a parking lot. It was offered to us in February, but we had to run through a host of better options before accepting it. This is not a permanent location, either. If we are offered a covered facility that is spacious enough and in the Downtown core, we’ll jump at it. In addition, Parks and Rec says the long-term use of this block has not been determined. However, we learned yesterday that there is talk of extending the North Park Blocks to the north into what is now the Post Office property. USPS is moving to their new facility near the airport next month. The old building will be coming down. During the Great Depression of the 1930’s “hobo signs” were scratched on pavement or fence posts in front of houses across the country. 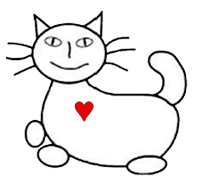 The symbol of the smiling cat meant, “Kindhearted Woman” – someone who could be counted upon for a friendly word and perhaps a warm meal. In hobo language it was a high complement; today it still is. Potluck in the Park has adopted the smiling cat to symbolize what we stand for: A safe haven, rain or shine. We have been serving warm meals to those in need since 1991. Please take a few moments to watch this short video and learn more about Potluck in the Park.